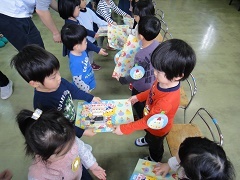 The April Birthday Party was held today. All of the 13 birthday children did a fantastic job, especially as it was the first time to see a birthday party for all of our new Junior friends! We checked everyone’s names and ages before singing the ‘Happy Birthday’ song and giving the birthday presents. 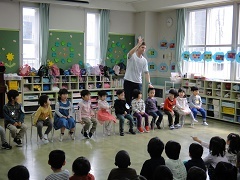 The birthday present from the teachers was a short play by the English teachers. 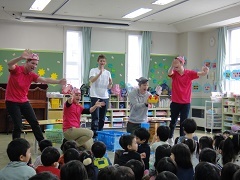 3 pigs and a wolf were playing together at kindergarten, but the wolf could not play nicely with his friends, stealing toys, not sharing and breaking the things they had made. After saying sorry for his naughty behaviour the 3 pigs and wolf could play nicely together. We hope that all of our kindergarten friends can play together nicely and make many new friends this year! Happy Birthday and well done everyone!